This quick and easy meal can be on the table in just 20 minutes. It also works well with tuna steaks too. Preheat the oven to 220°C, gas mark 7. Combine the teriyaki, honey, garlic and ginger in a small saucepan and simmer for a couple of minutes until thickened. Brush over the salmon fillets. Put the fish in a foil-lined roasting tin and leave to marinate for 5 minutes. Bake in the oven for 10 minutes, until opaque then brush with a little more dressing. Meanwhile, cook the noodles according to the packet instructions and drain. Warm the sesame oil in a frying pan. Sauté the salad onions, sugar snap peas and sesame seeds for 1 minute. Stir in the cooked noodles and coriander leaves. 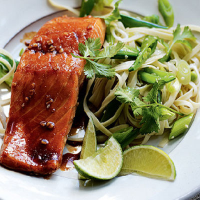 Serve the noodles and salmon with the lime wedges.